Today, In this we are going to show your how to unroot or unbrick your Samsung Galaxy note 5 and Flash the Stock Firmware. If you are running custom ROM on your phone or rooted your phone and want to go back to the stock version and unroot the phone. 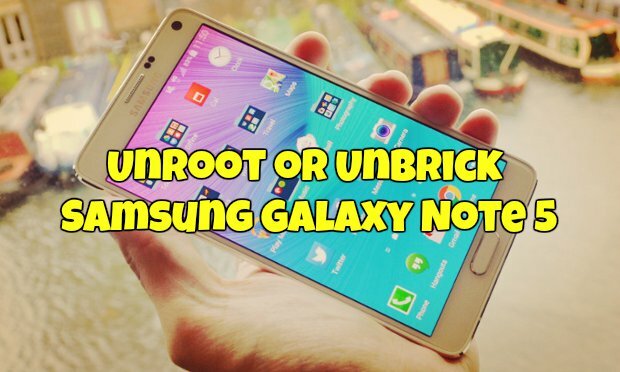 Here is the guide which you have to follow on your Galaxy Note 5 to back to the Stock ROM. The guide is pretty simple and takes a few minutes to complete all the process on the Note 5. All you need a Samsung Galaxy Note 5 Stock Firmware and ODIN flash tool to get started. This guide will work on any Note 5 models and only for the Note 5 user. Don’t try this guide in any other android smartphones or tablets. So first you have to do is take the full backup of your phone. Check out our guide here how take the backup of android smartphone and tablets here. Once completed, read all the below mention steps carefully and follow them step by step on your Note 5. Step 1. First install Samsung Galaxy Note 5 USB drivers on Windows PC here. Step 2. Download the Samsung Galaxy Note 5 Stock Firmware from here and extract the folder on yoiur desktop. Step 3. Download ODIN flash tool form here to flash the firmware on your phone. Extract the folder and you will see the ODIN.exe file in the folder. Step 4. Now Turn off your Galaxy Note 5 and Boot in download mode. TO do this Hold down Volume Down + Home + Power button at the same time. Step 5. Once you Note 5 is in download mode. Connect it to the PC with USB cable and run the ODIN.exe file on your desktop. Step 6. If everything is right and drivers are working properly. You will see the blue box on the ODIN screen, if not reinstall the drivers again and reboot your PC. Step 7. Now select the AP option from the ODIN screen and select the firmware file that you extracted in Step 2. Step 8. Hit the Start button from the ODIN screen to start the flashing process. Step 9. Once completed you will see the PASS messages on the ODIN and Phone will reboot automatically. Now you can disconnect your phone. Step 10. If you phone stuck on the boot loop or in the Samsung Android Loog. Then turn off the phone and reboot in recovery mode. TO do this Hold down Volume Up + Home + Power button at the same time. Now from recovery select Wipe Data/Factory Reset and after that Wipe cache partition. Now reboot you phone. Now your Note 5 is unrooted and running on the Stock Firmware.